Invoking the spirit of "Star Trek" in a scholarly article entitled "To Boldly Go," two scientists contend human travel to Mars could happen much more quickly and cheaply if the missions are made one-way. They argue that it would be little different from early settlers to North America, who left Europe with little expectation of return. 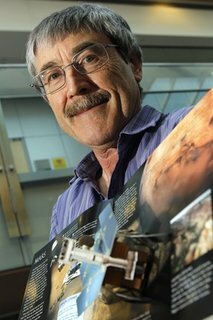 "The main point is to get Mars exploration moving," said Dirk Schulze-Makuch of Washington State University, who wrote the article in the latest "Journal of Cosmology" with Paul Davies of Arizona State University. The colleagues state — in one of 55 articles in the issue devoted to exploring Mars — that humans must begin colonizing another planet as a hedge against a catastrophe on Earth. Mars is a six-month flight away, possesses surface gravity, an atmosphere, abundant water, carbon dioxide and essential minerals. They propose the missions start by sending two two-person teams, in separate ships, to Mars. More colonists and regular supply ships would follow. The technology already exists, or is within easy reach, they wrote. An official for NASA said the space agency envisions manned missions to Mars in the next few decades, but that the planning decidedly involves round trips. President Obama informed NASA last April that he "`believed by the mid-2030s that we could send humans to orbit Mars and safely return them to Earth. And that a landing would soon follow,'" said agency spokesman Michael Braukus.